Oh rugger, a sport so English we’d play it on crumpets in the Queen’s honour if we could. Granted, we’re not the best at it any more but when it comes to rugby style, well at least that is still something we can claim for our own. And the rugby shirt can be the creative outside-half of your wardrobe, posh and preppy if that’s your thing but just as happy playing with urban streetwear looks. The jersey has come a long way. Rugby was created in 1823, when William Webb Ellis, a student at Rugby School first ran with a leather ball during a game of footie. The sport grew in the British public school system and as a way to differentiate teams, uniforms were created. The first rugby uniform was a collared dress shirt worn with a bow tie, but the tails were found to be too easy to grab hold of. Buttons were also taken off the front lest they scratch another player’s face. The wool jumpers that succeeded the dress shirts also failed to be fit for purpose with the cloth becoming heavy in the wet British winter so the more breathable cotton was chosen as the de facto choice of fabric. The collar remained and bold stripes came into play with horizontal lines reigning (vertical stripes were already taken by footballers). As time went by the stiff collars became less prominent than your typical dress shirt in an attempt to prevent a pesky prop clinging onto them for dear life, which takes us pretty much up to the modern version of the rugby shirt (ignoring the skin tight sausage cases the pros play in these days). People didn’t cotton onto the rugby shirt as a fashion piece until over a century later. It was the 1950s where the now-timeless preppy wardrobe was first formulated. A thicker alternative to the polo shirt, American teens began wearing rugby shirts as a way of showing off their athleticism while still keeping their look tidy (we are about 40 years off sweatpants as fashion here). Since then the shirt has dipped in and out of fashion along with other preppy staples like the sweatshirt, peaking in the 1980s and 1990s as a symbol of old money yuppiness (which was then hijacked by subversive hip-hop stars) before returning big time over the last couple of seasons. You can also try wearing them under a blazer as an easy alternative to a normal button down shirt (see Mick Jagger above). And side-stepping away from its traditional, buttoned-up origins, the rugby shirt has also been greeted with open arms by the streetwear world, with the loose and relaxed shape suiting oversized fits, although we would stay away from wearing one with joggers – the skiving lectures until the next rugby social look was never en vogue. Tommy has been taking a lot from its early 1990s archive recently. It was a period when both the rugby shirt and the preppy American brand were riding a massive wave, with Snoop Dogg making his performance debut on the star-making Saturday Night Live in a Tommy rugby shirt. With its bold logo and colour blocking pattern it’s a version that didn’t really need to be messed with and although Tommy Hilfiger does more traditional hooped shirts, it’s this ’90s style that still rules its rugby shirt roost. In a weird sort of mirroring to Snoop Dogg’s rugby shirt wearing SNL performance in 1994, one of the hottest hip-hop stars the last few years Chance the Rapper wore the style for his SNL hosting appearance in 2017. Only this time it wasn’t Tommy, it was Ralph Lauren. Both brands chase that ’90s style but Ralph Lauren is more vibrant with its colours and patterns while holding off on the obvious branding. Not one to miss a trend, the Italian fashion house was the main torchbearer for the rugby shirt’s ascent into high fashion. Surprisingly for Gucci, its rugby shirt offering is quite conservative – there are no baroque swirls here. Instead, we see traditional hoops and contrast collars in thick cotton, although it does do versions that feature bold logos and patterns over the chest (a style more often associated with rugby league shirts). This being Gucci, the brand can’t resist little flourishes here and there. American founded, now headquartered in Stockholm, Sweden, Gant is recognised as the brand that brought the button down shirt to the mass market back in the 1950s. Aimed at a slightly older customer than its other preppy American rivals, the Gant rugby shirt is a sensible and hard wearing choice for the man who is less bothered about popping out on Instagram and more about enjoying a good Sunday roast down the pub. Created by Brendon Babenzien, ex-creative director of Supreme, Noah successfully merges the worlds of surf, skate and music into a brand now at the crux of streetwear. But, crucially, it’s the quality of the clothes that shines through – the brand only works with factories that practice safe working conditions and place craftsmanship above all else. As a result, its rugby shirts of some of the best around, if you can manage to get hold of one that is. The oldest of the big four US preppy brands, J Crew might not have the same cool cache of Ralph or Tommy, but for someone more concerned with style than showing off their logos, it can more than hold its own. The brand was one of the torchbearers of the rugby look in the 1980s and while it does offer those throwback wide striped and block-coloured jerseys, it also has newer designs that keep the feeling classic while subtly playing around with those verticals. New York-based Rowing Blazers is a brand obsessed about detail and heritage, a trait which has ensured it’s attracted such wide ranging fans as Timothee Chalamet, Haider Ackerman, leagues of NBA stars and plenty of streetwear aficionados. Theirs are made the old fashioned way – on vintage knitting looms and with heavyweight 12-gauge cotton, plus, each design has a story behind it such as the ‘Jagger Stripe’ shirt, which was based on a design worn by Mick back in the day. 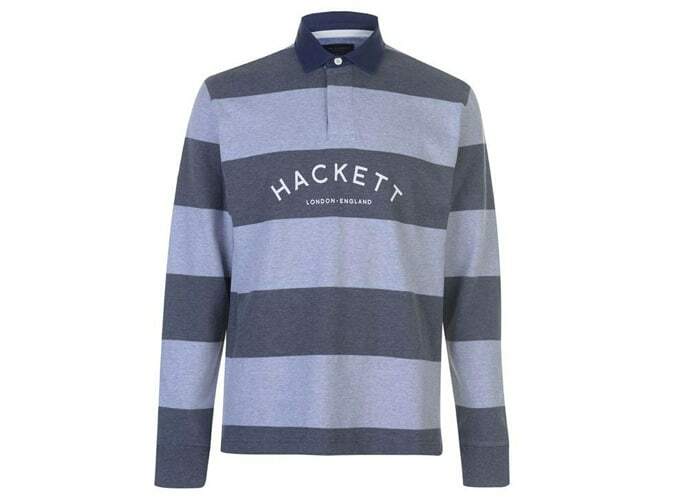 Hackett is synonymous with the type of Englishman who would most probably have lived in a rugby shirt growing up (Prince Harry is a good point of reference). For gentlemen by gentlemen, its rugby shirts are classic P.E. lesson in 1954 fare with a relaxed fit in thick cotton and bold, classic neutrals like white or blue. The style of rugby shirt on offer at David Beckham’s fashion brand Kent & Curwen is a bit like Goldenballs himself, showing up the new kids on the streetwear block with a timeless and classic look that will never cease to be stylish. The collars are rounded as opposed to pointed and designed to be worn up like you’re some debonair Welsh fly-half, while the breast patches on some of the shirts are a nice touch, like something your mum would sew on the night before school. Coming from the retro lifestyle part of the monolithic German sportswear makers, Adidas Originals rugby shirts take most of their influence from 1980s continental Europe rather than anything to do with British public schools or 1990s LA. In fact, there’s a touch of the five-a-side footie as well in this heritage polo and rugby shirt hybrid, so you can tick off the vintage football shirt trend off too. Anyone who has been to a Thom Browne catwalk show will know the American designer lives in some sort of Dr Seuss land of uber-twee outrageousness. It’s all founded in the preppy world that rugby shirts exist in, and while the Thom Browne version is vastly different from others on this list, the style (if not the price tag) does come with some restraint. Expect multi-colours and disjointed stripes, but above all a high fashion quality the designer has cultivated after fifteen years in the biz. There is no better place to be on a Saturday than NYC, whether you want a night on the town or a new rugby shirt. Less than a decade old, this brand rests on a unique formula of elegant streetwear that doesn’t try too hard to stand out. Its take on the rugby shirt, therefore, doesn’t try to reinvent the traditional. Instead, it just aims for a subtle spin with shades like plum and seafoam green in slimmer stripes. Marks & Spencer has been a trusty bastion of the British high street for over two centuries and is the only brand on this list whose history can match that of the sport of rugby itself. Its rugby shirts sit in the Blue Harbour section of its menswear collection, which is aimed at the older gentleman so expect classic patterns in relaxed fits. When it comes to fashion, the French are top of the pile and while Aimé Leon Dore might only sound gallic, the young New York streetwear brand does tap into that all-conquering sartorial spirit. The ALD blueprint takes on a more 1990s hip-hop bent with a hoodie-like pouch and in bold primary colours, while the scripted logo adds a touch of French panache. While we might all have heard the phrase ‘false economy’ Swedish fast fashion chain H&M has a tendency for surprising us with its wares. So while the price is by far and away the least expensive on this list, its styles are some of the most eye-catching, and in 100 per cent cotton there is arguably little difference in quality to many of the others.